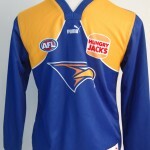 This weekend is the last round of the 2011 AFL Home and Away Season . The top eight teams are decided , now all that remains is for the various placings, in the eight , to be finalised . Can Collingwood continue their unbeaten record , or will Geelong , reeling from last weekends surprise defeat , cause an upset victory at friday night footy ? Hawthorn , currently third on the ladder , is poised to steal second spot if they defeat the Suns , or they could be tipped down to fourth spot if they lose and the Eagles win . Carlton and Essendon, will hold fifth and eighth spot respectively , as Essendon have a bye this week and Carlton will retain fifth spot , win, lose , or draw. 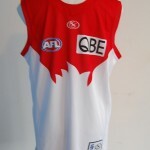 St Kilda and Sydney have tough games , with the Saints playing the Blues , and the Swans playing the Lions . Their spots in the eight could be reversed , but both are up for a hard finals campaign . 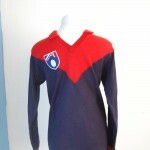 The rest of the teams in the competition will play their last game for the year , with a mixture of pride and regret , and will look foward to a holiday break , followed by a frantic trading period , then training for a 2012 campaign . 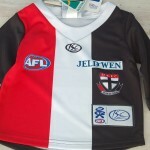 Its a bittersweet weekend for many fans , and all will be watching , to cheer their teams to victory , wearing their football jumpers , jerseys , guernseys . 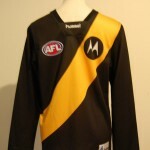 This entry was posted on Friday, September 2nd, 2011 at 5:57 pm	and is filed under AFL, football jumpers, NRL. You can follow any responses to this entry through the RSS 2.0 feed. Both comments and pings are currently closed.